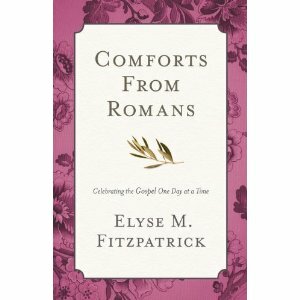 When asked if I would like to read and review a copy of Comforts from Romans , by Elyse Fitzpatrick, I immediately said yes. After having read Comforts from the Cross I was curious to check this one out. The subtitle of Comforts from Romans - Celebrating the Gospel One Day at a Time - should tip you off that this book is a devotional. There are 32 short (2 to 3 pages each) readings to help us focus on the book of Romans, the Gospel message and love of Christ. Not necessarily in that order. As the title suggests, every single teaching in this book is taken from the Romans. It is Fitzpatrick's hope that the reader will be refreshed and encouraged by the message of the Gospel. And while encouragement is good and healthy, she also notes, it is important that the teaching in Romans should bring about conviction in your heart. True conviction leads to true repentance and there is a tremendous need for both. When we have confessed our sins, He is faithful and just to forgive us our sins and we will find ourselves reconciled to Christ, by Christ. Saving yourself is not your job. God has already done the work to accomplish your salvation. As she writes, "You are not the subject of Romans. He is, and that's how it should be." We have been saved, we are being saved and it is not of our own efforts. Our duty as Christians is to follow hard after Christ, learning more about Him and what He expects of us as His dear children. I have indeed felt choked with humility of late. (It was helpful AND convenient to take a little bloggy break this last week to finish a scrapbook and think through some other non-book-related issues.) This book came at a good time and assured me that while I am indeed - most assuredly! - a sinner, I have also been saved by grace. I've explained in the past that I'm not a terribly big fan of devotionals. I think the stop-and-start of each lesson causes me to lose attention quickly. I tried very hard to read this book at the rate of one devotional a day but that soon fell by the wayside and I started reading through it as I would a regular book. Really, this book is simply a tool to get your mind engaged with scriptures and you should feel free to use it in whatever manner serves you best. As far as devotions go though, this seems a very good and solid one with good chunks of meat to chew on. 1. Each Monday in March, Elyse Fitzpatrick will share devotional thoughts from Romans on the Crossway Blog. Crossway invites you to read (and re-read!) Romans 1-8 throughout the month of March, joining in with the devotion and discussion provided and prompted by Fitzpatrick. If you feel like you are behind in your Bible reading this year, this is an option to help you pick up and get started focusing on the most important book of all. CLICK HERE for more information on the Reboot Your Bible Reading Plan. 2. Crossway Books have authorized me to giveaway ONE copy of Comforts from Romans to one of you. 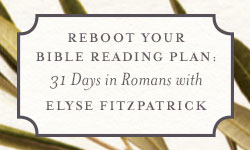 (Should you win then you have even more incentive to track with the Reboot Your Bible Reading Plan with Fitzpatrick!) This contest will be open through Tuesday, February 26th and is open to U.S. Residents only. THIS CONTEST IS NOW CLOSED. THE WINNER, as selected by random.org, IS #9 - Janna! Congrats! Thank you Crossway for providing a copy of this book to myself and another to one of my readers. I have had this one "bookmarked" since the beginning of the year (along with some others by Elyse Fitzpatrick) as I am participating in the Romans Project and want to focus on studying Romans this year. Thanks for sharing your thoughts on it! I'm not generally a devotional fan myself--since I often get frustrated with what I often see as Scripture-lite "studies"--but this sounds like it might be an exception. I really appreciate the reminder that Romans (indeed, all of Scripture) is not about me. Wow, that actually does sound good. I'd love to win it. I enjoyed her book Because He Loves Me. This looks really good! My non-plan plan is limping along this year, so this might be just what I need. I'm behind in my Bible reading again. I'd love to be entered! I 've yet to read anything by Fitzpatrick, this sounds like a good place to start!